Weslo is one of 10 best brands of Icon Health & Fitness Corporation – the leading fitness equipment in the world. 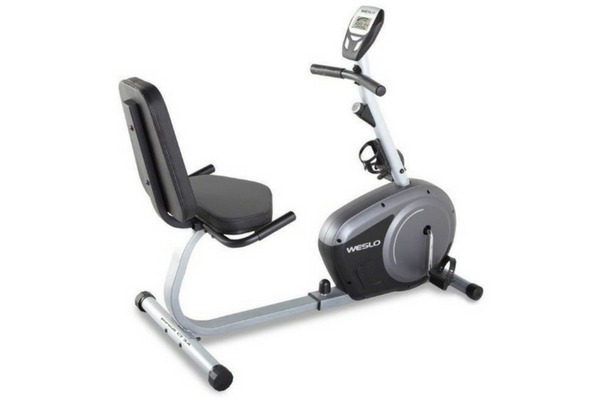 You could see some well-known and reliable brands of this organization such as Proform, Weider, Altra Zero Drop Footwear, HealthRider, FreeMotion Fitness, iFit, etc … And among fitness types of equipment above, the best-selling item of this brand that attracts thousands of customers is Weslo exercise bike (another name is Weslo stationary bike). 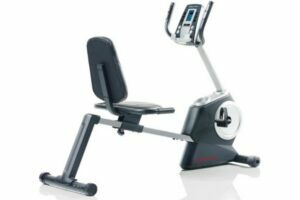 Our Weslo exercise bike reviews fairly evaluate strengths and weaknesses of all products which are considered to be the best option in the marketplace. Therefore, we promise to provide you basic background with our supportive suggestions from this review. Many people have the habit of using upright exercise bikes. However, when using a recumbent one, they are guaranteed by the more comfortable seat, which is considered to be better than an upright option. That is the reason why Weslo concentrates on Weslo pro and Weslo pursuit recumbent bikes as two key products. Firstly, we mention the best item in this category under the eyes of our experts. This is Weslo Pro 11.2x Recumbent Bike. Using Weslo Pro exercise bike in general and Weslo Pro recumbent bike, in particular, engages you in a worthy purchasing investment. First off, Weslo Pro 11.2X is a simple. You will find it super easy to assemble. It takes you less than an hour to spend for this 84.2-pound machine, quite light. However, despite the lightweight, it is still very sturdy. The assembly manual by Weslo, as usual, is quite detailed, from step by step and it makes sure you will not be confused. All the accessories are well packed. Then, Weslo Pro Bike promises to offer the simplicity of design and features to be suitable for all types of customers. Weslo 11.2x uses electromagnetic resistance for you to choose your suitable workout programs from easy to difficult tasks. About the screen, many people agree that the LCD screen is large enough for an easy-to-read display. Then, you can get your detailed workout feedback such as burned calories, resistance, time, distance, RPM, heart rate, and results. EKG Grip Pulse Sensor is very valuable in attempting to provide your target heart rate zone. Oh, and what you know, there is an electric control panel for an ease of adjusting your stride. It boosts the suitability of the machine to all members of your family. One of the great features of Weslo Pro Recumbent Exercise Bike is the adjustable and padding seat, which enables you to make a better effort in a long time without any discomfort. Our Weslo Pro 11.2x Review shows that Weslo Pro 11.2x is a great option for comfort, ease of using and much workout results. There is little chance that this machine will dissatisfy you. In order to lose weight and gain the ideal body shape, it requires much effort from users. That is why people often look for an exercise machine which could support them at home many times without discomfort and inconvenience as same as going to a gym room. Weslo Pursuit CT 4.2 is an outstanding home gym option for many reasons. Weslo Pursuit Ct 4.2 is designed in such a modern way that is very comfortable to users. This result comes from the combination of recumbent-style frame, oversized and adjustable seat. It makes the machine comfortable for a long time of usage and freely adjusts the seat position to be suitable for different heights. With step-through design, it is not difficult for users to follow the whole process in a safe and convenient way. Then, we talk about its variety of 8 preset workout programs. Depending on this design, it makes Weslo Pursuit CT 4.2 Recumbent Bike more supportive than Weslo Pro. Then, it challenges customers to have a better workout program through different workout options. Some people may think that this number of programs is not appropriate for harder progress. However, in fact, within this price, we think that it is acceptable. The machine has large LCD console, which provides workout feedback through statistics of speed, time, distance, calories burned and pulse as you train. A major plus of this exercise bike is the ability to track heart rate zone through the equipment of EKG grip pulse. Weslo Pursuit 4.2 is also equipped with transportation wheels. This leads to an ease of moving and carrying. 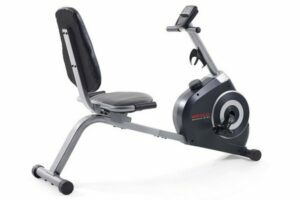 In general, if you are looking for a product which is guaranteed by quality and reputation, Weslo Pursuit CT 4.2 Recumbent Exercise Bike is a great option. As in mid range, the whole package of features offered by this bike is a big plus if you really want to find a good bike. We did some comparison this bike with more expensive bikes; you actually do not find a big difference. It is solid, has an acceptable price; and it offers impressive features. We are sure it is a good investment for your house. Weslo Pursuit CT 3.4 Recumbent Bike is a special exercise machine with a recumbent construction and oversized. On the one hand, it has a comfortable chair so that every user always wants to do more workouts for long hours. You also adjust the seated for your suitable height and change the situation whenever you need. Why does a recumbent bike need an oversized seat? Because with a large chair, your back gives you a big thank for a flexible adjustment. In other words, when you have an oversized chair, your back has an opportunity to keep in a fixed place greatly. Then, you feel comfortable to do the exercise. Moreover, you enable to adjust the seat to fit your position and your overall body before beginning the workout. Because each person has their own physical health, the workout intensity should also be suitable for them. If not, possible and dangerous accidents will happen under any circumstances. Then, they might have a serious side effect, and it is not easy to solve. But now, Weslo Pursuit CT 3.4 Recumbent Bike does not allow this issue appears thanks to the flexible intensity. It means that you could change the workout level for your suitable ability. Unlike any traditional exercise bike, this recumbent bike has a step-thru construction in design. You may begin your pedal easily and promptly. On the other hand, when you want to stop your workout, you can get off the bike without much hassle. With a high-end and large console, track your workout process in a few seconds only. A large LCD window helps you know your speed, time, distance, resistance, heart rate, and calories burned. Then, you could decide to continue the process or not. Try to use the guesswork by selecting from two workouts made by a Certified Personal Trainer in these workout apps. The easy-turn nugget allows you increase or decrease the manual resistance smoothly that makes it easy for reaching. Water bottle holder: you might not worry about dehydrating when pedaling anymore thanks to water bottle holder. Furthermore, you do not have to postpone your workout program and add water to your body. In other words, you can drink water and continue the exercise at the same time. Inertia-improved flywheel: this feature will support you have a smooth pedal and you feel much more comfortable to challenge every level as well. Weslo Pursuit CT 3.4 Recumbent Bike has a unique construction to attract users do exercises on a regular basis. A step-thru design to help you step through the bike and begin your process as quickly as you can. Begin your own way to catch your targets by opting one of two workouts with this recumbent bike. If your recent target is to get the best shape of your body, then you could select Weslo Pursuit E26 to support catch your aim. Or you can make this recumbent bike is a precious present for someone to enhance their health. I surely believe that a fitness machine is one of the most precious gifts for a receiver. On the flip side, users don’t waste time to come to a gym center and reduce the cost of this place. Just open your pedals with a suitable workout in 15 or 20 minutes only a day, you will save much money and valuable time. Health professional health often agrees that you need to find the fitness equipment that adjusts your own level to practice. The bike has flexible resistance, so you enable to increase or decrease the tension level. It will be an inconvenient stuff if you don’t have a modern technology. It will support you realize some important databases in the latest age. With Weslo Pursuit E26, you can know the distance, speed, heart rate, and calories removed to arrange new workout for the next time. Just touch the screen and select a workout that you want to challenge. Additionally, you could control your speed and change padded seat to fit your body shape in the LCD window to meet the comfort during a workout program. The frame of the bike is made of the sturdy stainless steel to withstand the weight capacity up to 250 pounds. On the flip side, this material also becomes corrosion-resistance coating to enhance the durability. With the adjustable arms resistance, you can create a perfect position to make you feel comfortable while pedaling. You just need to switch a knob to allow a flexible and easy change. Handy water bottle holder: stay hydrated when doing exercises is also extremely important for trainers. So, even if you just practice your workout programs on a recumbent bike, don’t forget to add water to your body by using an inbuilt water bottle holder. Inertia-enhanced flywheel: having a smooth pedal is a great feature to make you feel comfortable and it also inspires you to do the exercise regularly. Weslo Pursuit E26 provides you a perfect body with the entire body workout. You will have the strong upper body and extra strengths, especially your muscle groups in the legs often have an opportunity to practice by riding the bike every day. 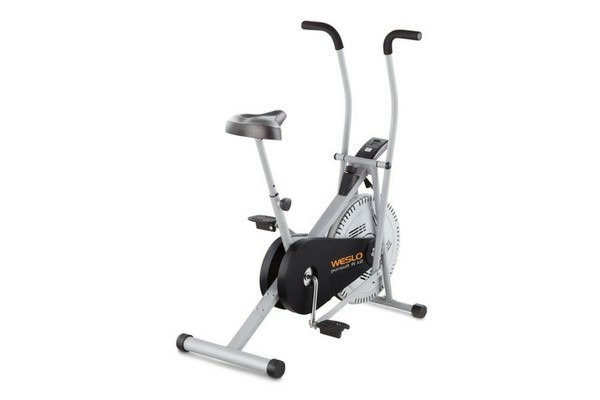 Weslo Pursuit 3.1 Exercise Bike may support every trainer to burn as many calories as they want to. With an oversized chair and adjustable seat, you quickly change the proper fit and feel comfortable during a workout program. The seat is created like a flexible chair with a soft cushioned in the back and the bottom. You should slide it forth and back to know your perfect fit. An LCD window with the RPM meter might control your workout progress through your practicing. Thanks to the LCD window, it displays your time, speed, distance, RPM and how your body burn calories. SMR™ (Silent Magnetic Resistance) is a modifiable resistance which provides consistent and quiet operation in every workout program. So, you change your personal workout with this flexible feature only. Get on and get off this recumbent bike easier with the Step-thru design. In addition, you enable to switch your position to fit on your body shape and get started the exercise in a few seconds only. Smooth flywheel: you might feel comfortable and convenient like you are riding on the actual road thanks to the inertia-boosted flywheel. Water bottle holder: Stay focused on the exercises is a good point to maintain, but you should not ignore the eater rehydration for your body to prevent the imbalance factors while riding. Smart devices holder: why don’t you do your workout and enjoy a movie or your favorite song at the same time? Open the smart device’s holder in this exercise machine and make your workout activities greatly. 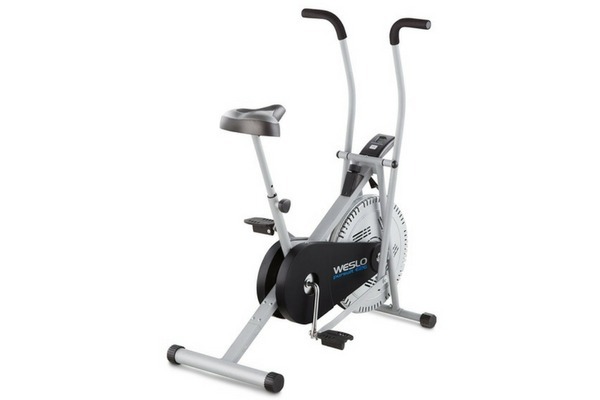 Weslo G 3.1 Exercise Bike will help you have the inspiration to do more exercises on a regular basis. If you don’t have this positive habit, your muscle groups are not toned. And this is the chance to develop belly fat and weight gain. Add the workout activity to your daily schedule and catch your perfect body on your hands! 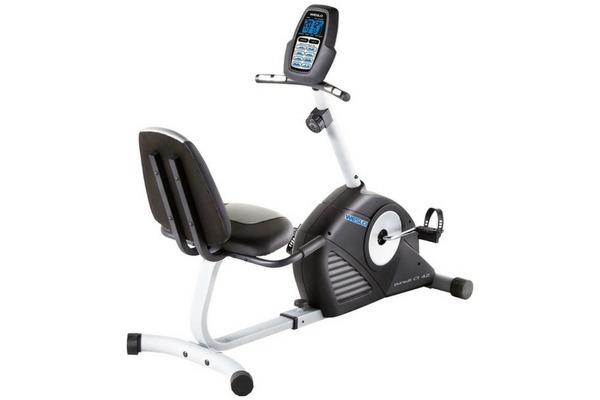 This is quite one of the most modern recumbent exercise bikes in this market. It seems quite compact with the steel frame. And it brings the modern and industry appearance of the bike. Your corner with the bike will look more neatly and do not waste any space on you. The best point to talk about this exercise bike is the ability. It not only builds the muscle, strengthen the legs, but also strengthens your arms while cycling. Also, it has a sturdy design. This allows you to keep stability during the training. The seat is designed to be padded well. You can adjust it easily to fit you. It is definitely an important point needs to be mentioned if you are looking for a new exercise bike. Being comfortable while training is one of the greatest things on the earth you should have. However, if you decide to do exercise for a long time, that convenience will not very positive as for short time. This seems to be the difficult situation for those who love cycling as well. In addition, the R 1.2 has a smart LCD screen. It allows you to record time, speed, distance and other features. Then you can easily control your status of training. Knowing your status of exercise, you will understand your ability and have the right decision if want to challenge your body. + Compact design: because of it, this bike will take a small space in your house. You will save more time for other needed facilities. + Upper-body workout arms: the bike not only serves lower body workout but also the upper ones. It helps you to improve the whole body quickly and efficiently. + Adjustable seat padding: it helps you to adjust the seat to comfort you while cycling. + Smart LCD window: this allows you to control your training situation through data about speed, time, distance and calories burned which are displayed on the screen. + This product is quite compact that seems a little bit small for someone. In fact, it can fit for people weights up to 250 lbs. However, it is not suitable for tall ones. This is quite inconvenient for user especially tall ones to choose a nice exercise bike for themselves. + Uncomfortable for a long time exercising: Despite the fact that the bike is designed with a comfortable seat, and it is true for most of the time. In the situation that you want to train in longer time, you may get some frustration with that seat. Weslo Pursuit R 1.2 is a perfect choice for if you are looking for a cheap and full of industry standard characteristics exercise bike. It can improve your body health in both upper and lower part. It can comfort you with the modern seat design. And it will support you much in controlling your training situation. But, you should take a look at some minor disadvantages that we mentioned previously before getting one for yourself. Finally, you have read our reviews of the Weslo exercise bikes. Although each machine has its benefits and drawbacks, the main target of these products is supporting users to have their perfect body. Shine on the customer’s way is the mission of Weslo’s producer. Besides, they hope that clients always have good health to create happiness in the entire life because the manufacturer has understood that their patrons are not happy unless they improve a healthy life. We wish you good luck in finding best exercise bikes for your need.